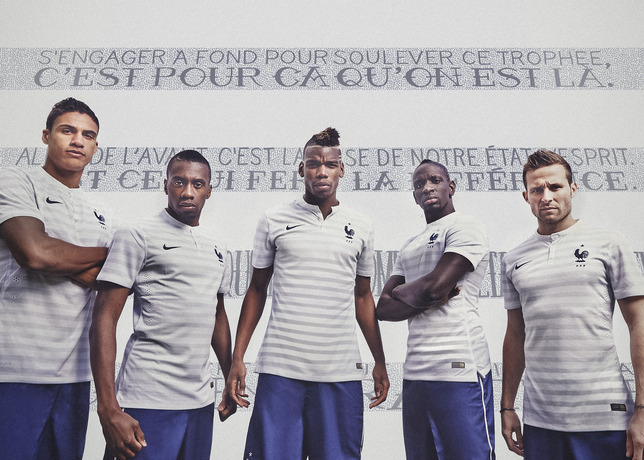 Yesterday at French Federation training ground Clairefontaine, the future of French football — Raphaël Varane, Blaise Matuidi, Paul Pogba, Yohan Cabaye and Mamadou Sakho — unveiled the new French national team away kit for 2014, and made their own personal pledges to make their nation proud this summer. France will compete in Brasil this year in an away kit that combines their inherent style and flair for fashion with the best in performance innovation to produce an elegant new look. The “Marinière,” a classic French design motif, makes a subtle return to the away jersey in the form of a tonal grey mariner stripe. 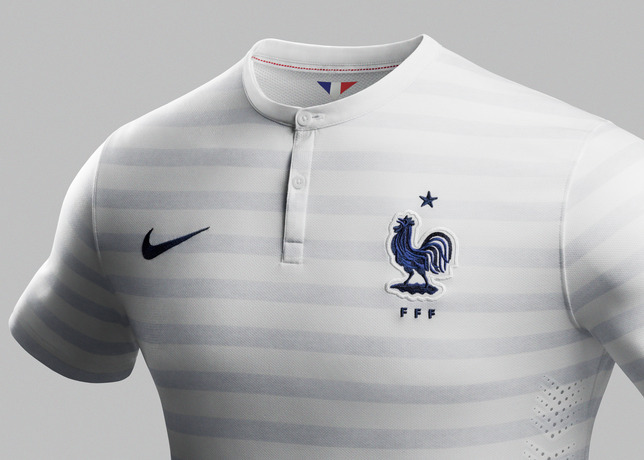 The jersey also features a new crest, inspired by the classic cockerel worn by the French team in 1958. The symbol is enlarged, freed from its badge and given the space to become the ultimate symbol of national pride. The crest is meticulously embroidered and inspired by the intricate bullion technique, which lends textural interest. The new and bigger blue cockerel stands proudly alone with its elegant plume of feathers elevated. The away jersey has a stand collar, and inside the back of the neck is a small pennant featuring the red, white and blue colours of France’s tricolor flag. The shorts are midnight navy blue and feature the same stylish and unique denim effect found in the home jersey. This fabric is inspired by the southern French town of Nimes, the birthplace of denim and originator of the fabric’s name (de Nimes). Denim was invented in the 17th century as a mix between wool and silk, and Nike Football designers chose the fabric for the shorts to represent the rawness of denim and the elegance of silk. Along each side of the shorts is selvedge-style taping, inspired by the premium denim edge-finishing technique. Simple and iconic, the shorts are slimmer and more tailored to the body, with a cut specifically designed to aid movement and comfort. The centre back of the shorts features Nike’s signature laser vents to promote cooling and moisture management. The new away socks are in classic white. “I love the new kit, simple and elegant. And not only does it look great on the pitch it also helps to keep us comfortable and focused on our game,” said French player Raphaël Varane. 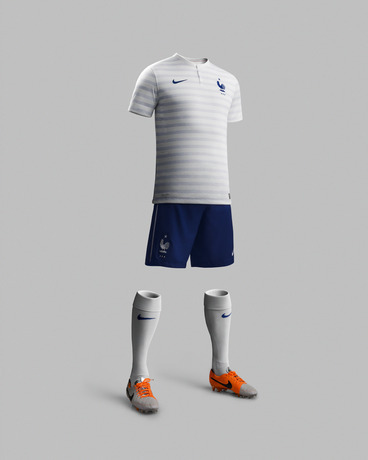 The French national team away kit is available on www.nike.com to pre-order from March 4 and on sale from April 3. 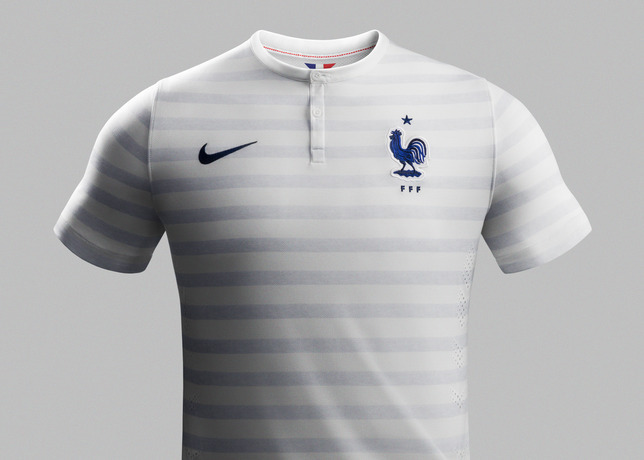 What do you think of the new France away kit for 2014? Let us know in the comments section below or on our Twitter and Facebook pages.